The Global Volcanism Program has no activity reports for Harra of Bal Haf. The Global Volcanism Program has no Weekly Reports available for Harra of Bal Haf. The Global Volcanism Program has no Bulletin Reports available for Harra of Bal Haf. The Harra of Bal Haf is a small volcanic field along the Gulf of Aden in southern Yemen that contains tuff cones and large aa lava fields. The volcanic field lies along the coast about 100 km SW of the city of Al Mukalla. Lava flows erupted from cinder cones blanket much of the volcanic field and produce an irregular shoreline. One fresh-looking basaltic flow may be of historical age (Catalog of Active Volcanoes of the World). The At-Tabâb tuff cone along the coast rises about 200 m from the sea and has a 1.5-km-wide crater partially filled by a cinder cone and associated lava flows. An adjacent tuff cone to the east is lake filled. The Global Volcanism Program is not aware of any Holocene eruptions from Harra of Bal Haf. If this volcano has had large eruptions (VEI >= 4) prior to 10,000 years ago, information might be found on the Harra of Bal Haf page in the LaMEVE (Large Magnitude Explosive Volcanic Eruptions) database, a part of the Volcano Global Risk Identification and Analysis Project (VOGRIPA). There is no Deformation History data available for Harra of Bal Haf. There is no Emissions History data available for Harra of Bal Haf. 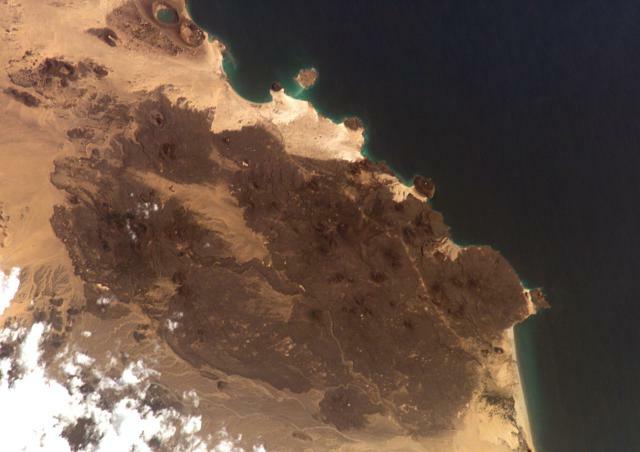 The Harra of Bal Haf volcanic field fills much of this NASA Space Shuttle image taken along the Gulf of Aden in southern Yemen (with north to the lower left). Dark-colored lava fields cover much of the volcanic field and create an irregular shoreline. One fresh-looking basaltic flow may be of historical age. Two large tuff cones are visible along the coast at the upper left, one of which is lake filled. A road cuts across the volcanic field from the town of Bal Haf at the lower right. NASA Space Shuttle image ISS006-E-5153, 2002 (http://eol.jsc.nasa.gov/). There are no samples for Harra of Bal Haf in the Smithsonian's NMNH Department of Mineral Sciences Rock and Ore collection. Large Eruptions of Harra of Bal Haf Information about large Quaternary eruptions (VEI >= 4) is cataloged in the Large Magnitude Explosive Volcanic Eruptions (LaMEVE) database of the Volcano Global Risk Identification and Analysis Project (VOGRIPA).